The total cost for the Hertage Hatching program is $250 and includes Silkie hen/egs & supplies with free 1 hour classroom presentation, as well as free delivery and pick up of the chickens and supplies. NoTax. See Heritage program #1 to see details of this Kit. Individual fertilized hatching EGGS for incubating are $4. each + delivery.. (Either Americana Blue eggs or small Silkie eggs). * KIt #1 includes 6 fertilized eggs and supplies is $50 + delivery and with the presentation $100. + delivery. ** Kit #2 with 12 fertilized eggs and supplies is $85 + delivery and with the presentation is $130. + delivery. Presentations are also available without hatching any eggs. The chickens and eggs and little chicks will be brought for the chidren to experience.. Single classroom @ $60 max 28 children. Double classroom @ $85. max 52 children. . The delivery or mileage cost is a flat rate $25. 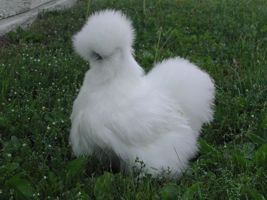 Silkie Chickens available come in white, black, red, blue or partridge colors. They are easy for children to handle and are a very endearing way to learn about the stages of development, raising them for food and the significance of heritage breeds. Please inquire and book early as there are a limited number of chickens available.